Dickoya (Sri Lanka), May 12 (PTI) Prime Minister Narendra Modi today said Sinhala and Tamil communities in Sri Lanka should strengthen unity and harmony as he assured India's full support to the steps taken by Colombo to improve the living conditions of minority Tamils in the country. "Diversity calls for celebration and not confrontation. Sinhala and Tamil people and languages existed harmoniously," Modi told the Tamils of Indian origin in Dickoya town in the tea growing Central Province of Sri Lanka. Sri Lanka is still recovering from the wounds of a nearly three-decade long bloody civil war between the government and the Liberation Tigers of Tamil Eelam, which fought to create an independent Tamil state in the north and the east of the island. The war caused significant hardships for the Tamils and resulted in deaths of an estimated 80,000 100,000 people. "We need to strengthen, not separate, (these) threads of unity and harmony," Modi told thousands of Tamils during a public rally in the presence of Lankan President Maithripala Srisena and Prime Minister Ranil Wickremesinghe. 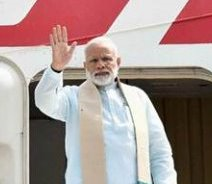 Modi, who made a helicopter journey to Dickoya, said he was aware that the Sri Lankan government is taking active steps to improve living conditions of Tamils including a 5- year National Plan of Action. "The Government and people of India are with you in your journey towards peace and greater prosperity," Modi said. He announced that India would provide 10,000 additional houses in the region. India has already provided 4,000 homes. "We have also decided to extend 1990 Emergency Ambulance Service, currently operating in Western and Southern provinces, to all other provinces," he said. The ambulance service was pledged by Modi in his first visit to Sri Lanka in 2015. Modi recalled Mahatma Gandhi's visit to central Lanka some 90 years ago to spread the message of socio-economic development and said in commemoration of his historic visit, Mahatma Gandhi International Centre was set up with Indian assistance in Matale in 2015. Addressing the public rally, Modi said, "You and I have something in common. I have a special association with tea". "Ceylon tea is world famous what is lesser known is your sweat and hard work that is behind it," he told the crowd, adding that people all over the world are familiar with famous Ceylon Tea that originates in this fertile land. During his address to the Tamil community, Modi praised them saying they speak one of the oldest-surviving languages in the world and it was a matter of pride that "many of you also speak Sinhala." By taking the names of Muralitharan and MGR, Modi tried to bridge the physical gap that divide the Tamil population in Sri Lanka and India. Modi ended his speech quoting celebrated Tamil poet and philosopher Thiruvalluvar, "Wealth will find its own way to the man of unfailing energy and efforts." He also held aloft the hands of Sirisena and Wickremesinghe in a show of solidarity to the cheer of the crowd. Later, Modi met regional leaders of the Tamil community.